Commentary.four wolf brothers— It is interesting to compare this tale to that of the four primordial Bear brothers, White Bear, Blue (or Gray) Bear, Red Bear, and Black Bear. White Wolf and White Bear both have control over holy things. Blue Sky and Blue Bear both have special connections to the control of day. Black Bear, like Black Wolf, does have some connection to the night, since the founder of the Black Bear Subclan is said to have originated in the spirit world as a Nightspirit. The "odd men out" are Gray Wolf and Red Bear. Nevertheless, they do have a match inasmuch as Red Bear is in charge of maintaining (being a guardian of) the earth; he has special functions in connections with war, and he is a guardian of the gate to the land of the dead. Links: Wolf & Dog Spirits, Earthmaker. 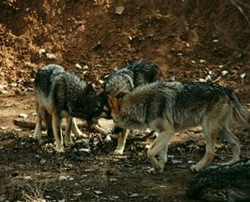 Stories: mentioning Gray Wolf: The Old Man and His Four Dogs, The Man Whose Wife was Captured (v. 1), Wolf Clan Origin Myth (vv. 1-2); relating to dogs or wolves: A Man and His Three Dogs, White Wolf, Wolves and Humans, The Wolf Clan Origin Myth, The Old Man and His Four Dogs, Worúxega, The Dogs of the Chief's Son, The Dog that became a Panther, Baldheaded Warclub Origin Myth, The Wild Rose, The Man Whose Wife was Captured, The Resurrection of the Chief's Daughter, The Canine Warrior, The Dog Who Saved His Master, The Raccoon Coat, Wojijé, The Big Eater, Why Dogs Sniff One Another, The Healing Blessing, The Medicine Rite Foundation Myth, Trickster Loses His Meal, Sun and the Big Eater, Redhorn's Sons, Trickster, the Wolf, the Turtle, and the Meadow Lark, Hog's Adventures, Holy One and His Brother, The Messengers of Hare, Pete Dupeé and the Ghosts, Grandmother's Gifts, The Hočąk Migration Myth, Bladder and His Brothers, The Stench-Earth Medicine Origin Myth, The Old Man and the Giants, Rich Man, Boy, and Horse, Kunu's Warpath, Morning Star and His Friend, Chief Wave and the Big Drunk; Peace of Mind Regained (? ); mentioning white wolves or dogs: White Wolf, The Old Man and His Four Dogs, The Man Whose Wife was Captured, Worúxega, The Messengers of Hare, Wolf Clan Origin Myth (vv. 1, 2), Wolves and Humans, A Man and His Three Dogs, Grandmother's Gifts, Peace of Mind Regained (? ); mentioning the Wolf Clan: Wolf Clan Origin Myth, Bear Clan Origin Myth, Hočąk Clans Origin Myth, Little Priest's Game, The Journey to Spiritland (v. 3), The Medicine Rite Foundation Myth; mentioning Earthmaker: The Creation of the World, The Creation of Man, The Commandments of Earthmaker, The Twins Get into Hot Water, The Twins Retrieve Red Star's Head, The Lost Blanket, Earthmaker Blesses Wagíšega (Wešgíšega), The Man Who Would Dream of Mą’ųna, The First Snakes, Tobacco Origin Myth, The Creation Council, The Journey to Spiritland, The Resurrection of the Chief's Daughter, The Seven Maidens, The Descent of the Drum, Thunder Cloud Marries Again, The Spider's Eyes, The Boy who was Blessed by a Mountain Lion, Hawk Clan Origin Myth, Fourth Universe, Šųgepaga, The Fatal House, The Twin Sisters, Thunderbird Clan Origin Myth, Elk Clan Origin Myth, Deer Clan Origin Myth, Bear Clan Origin Myth, Wolf Clan Origin Myth, The Masaxe War, The Two Children, Medicine Rite Foundation Myth, The Petition to Earthmaker, The Gift of Shooting, Baldheaded Warclub Origin Myth, Bluehorn's Nephews, The Stone Heart, The Wild Rose, Earthmaker Sends Rušewe to the Twins, The Lame Friend, How the Hills and Valleys were Formed, The Hočąk Migration Myth, The Necessity for Death, Hočąk Clans Origin Myth, The War among the Animals, Lake Winnebago Origin Myth, Blue Mounds, Lost Lake, The Hočągara Migrate South, The Spirit of Gambling, Turtle and the Giant, The Shawnee Prophet — What He Told the Hočągara, The Hočągara Contest the Giants, Ghost Dance Origin Myth II, Bird Origin Myth, Black and White Moons, Redhorn's Sons, Holy Song, The Reincarnated Grizzly Bear, The Blessings of the Buffalo Spirits, Death Enters the World, Man and His Three Dogs, Trickster Concludes His Mission, Story of the Thunder Names, The Origins of the Milky Way, Trickster and the Dancers, Ghost Dance Origin Myth I, East Enters the Medicine Lodge, The Creation of Evil, The Blessing of Kerexųsaka, Song to Earthmaker, The Blessing of the Bow, The Stench-Earth Medicine Origin Myth, The Origin of the Cliff Swallow. Themes: a group of spirit animals sort into four different colors: The Blessings of the Buffalo Spirits, Bear Clan Origin Myth, Brass and Red Bear Boy, Wolf Clan Origin Myth, The Old Man and His Four Dogs; having the power to control the winds and/or the weather: Deer Clan Origin Myth, Wolf Clan Origin Myth, Bear Clan Origin Myth (vv. 1, 5), Blue Bear, The Chief of the Heroka, East Enters the Medicine Lodge (v. 2), East Shakes the Messenger, South Seizes the Messenger, The Dipper. 1 David Lee Smith (Thunder Clan), "How Gray-Wolf Became Guardian of the World," in David Lee Smith, Folklore of the Winnebago Tribe (Norman: University of Oklahoma Press, 1997) 158. 2 James Owen Dorsey, Winnebago-English Vocabulary and Winnebago Verbal Notes, 4800 Dorsey Papers: Winnebago (3.3.2) 321 [old no. 1226] (Washington: Smithsonian Institution, National Anthropological Archives, 1888) s.v. Kéračóga.